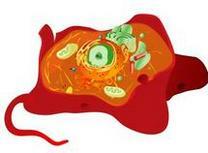 Image of eukaryotic cell. For labeled diagram of same cell, click here. Each title below is a link to all of the SPO course materials on that particular subject.​ New chemistry lectures have been added for Fall 2014. Instructors can find all cell biology lectures, old and new, on the VCBC Instructor's Corner page. New resources are regularly added to the Virtual Cell Biology Classroom. Like us on Facebook or follow us on Twitter @ ScienceProfSPO.